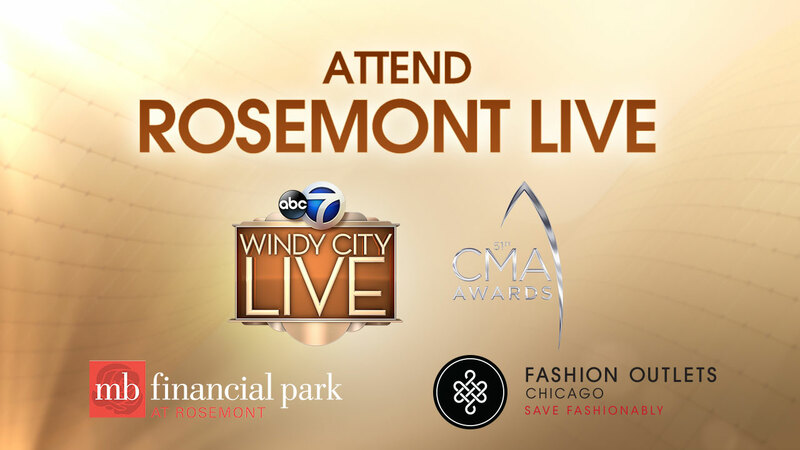 CHICAGO -- Windy City LIVE is teaming up with MB Financial Park at Rosemont and Fashion Outlets of Chicago Friday, September 22, 2017 from 1 p.m. to 2 p.m. to host a live show filled with exciting surprises, special guests and more! Please join us to be a part of our live audience. The first 50 audience members' onsite will receive a VIP gift bag filled with coupons/offers from Fashion Outlet retailors and MB Financial Park restaurants-- valued at more than $800! Please join us on MB Financial Park's great lawn, located in the center of the complex. Please be prepared to sit on picnic benches or the lawn. We ask that you do not bring any foldable chairs, coolers or alcohol. We do recommend bringing a blanket or towel to sit on in case the grass is damp or wet. Please arrive no earlier than 11:00am and no later than 12:30pm. VIP Gift Bags will be given out to the first 50 guests starting at 11am at the parking garage entrance to MB Financial Park near Kings and Sugar Factory. Weather permitting, the entire live broadcast will take place outdoors. In the event of rain or severe weather the live broadcast will be moved indoors to Zanies Comedy Club, located inside MB Financial Park at 5427 Park Pl. Rosemont, IL. 60018. One lucky audience member will win a trip for two to the 57th CMA Awards on November 8th. Audience member must be present to win. An entry form will be available at the check-in table located onsite. Concluding the broadcast the first 100 audience members that received a wrist band will be given an opportunity to take their photo with Windy City LIVE hosts; Val Warner, Ryan Chiaverini and Ji Suk Yi. The photo opportunity will take place inside Joe's Live, located inside MB Financial Park at 5441 Park Pl, Rosemont, IL 60018. The photo opportunity will start approximately at 2:00pm and end at approximately 3:00pm. Please bring your own camera for one of our team members to assist with taking the photo. ABC 7, Windy City LIVE, MB Financial Park at Rosemont, and Zanies Comedy Club are not responsible for any lost or stolen phones, cameras or personal items. MB Financial Park at Rosemont is conveniently located a block from the Donald E. Stephens Convention Center, the Rosemont Theatre and minutes from O'Hare International Airport and accessible from many major expressways in the south section of the Village of Rosemont. East on Interstate I-90 to River Road South exit. Continue two blocks and entrance is on the left. Exit River Rd. and turn right at the light. Exit at Balmoral Ave. (pay toll). Turn Right on Balmoral Ave. and move into the left lane. go thru the underpass to get to the front of the MB Park. I-294 S toward Indiana/O'Hare. From there exit IL-19 Westbound- Irving Park Road. Turn right at US-12 W/US-45 N/Mannheim Rd then take a slight right at Balmoral Ave. Turn Right on Balmoral and merge left. Go over I-294 bridge. front of the MB Park. I-90 E towards Chicago, then take the I-190W / I-294 S toward O'Hare/Indiana. CTA Blue Line stop and about half a mile from the Rosemont Metra station. There is a free shuttle to MB Financial Park from the Rosemont CTA Blue Line station. The shuttle is known as the "Entertainment Circulator" (Pace Route 811) and circulates every 10-15 minutes. Parking at MB Financial Park is free for a 24-hour period with validation from any of the venues. Handicap parking is located on the ground floor of the parking garage. Valet is available for $10 on the ground floor of the parking garage, in front of Fogo de Chao, and in front of Hofbruhaus. The parking garage is open 24 hours a day, 7 days a week. Parking garage height is six feet, ten inches.